Sorting through food waste, all in a day's work for those involved in pilot study. On an early morning this week, Sakiko Isomichi sat behind the wheel of a large pickup truck, making her daily rounds to a handful of Island restaurants that have begun sending food waste to Morning Glory Farm. 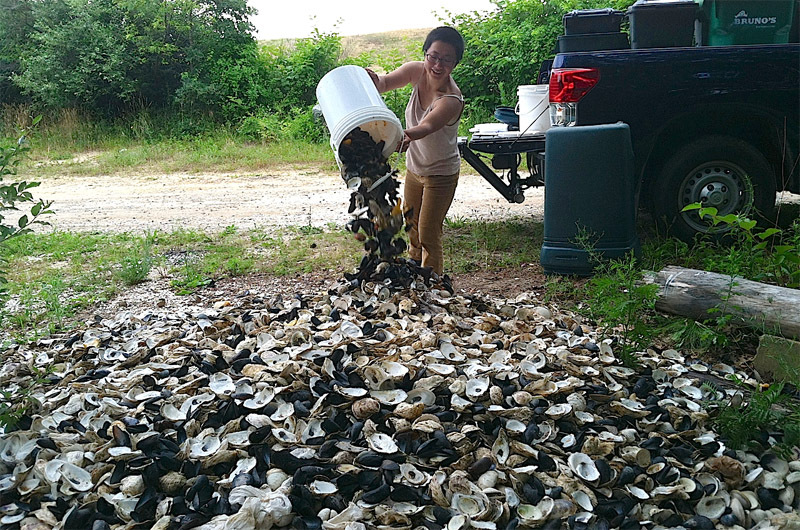 After picking up the final bin from the Port Hunter in Edgartown, she drove to a massive shell pile on the outskirts of the village and unloaded several five-gallon buckets of oyster shells. She then drove the remaining bins and buckets down the road to the farm — the only one on the Island licensed to accept organic waste from the community. Dozens of gulls soon descended on the pile of scraps, rinds and leftovers, most of them making a bee-line for a mound of fries from Lookout Tavern. The new four-month pilot study, which began in June, may set the stage for an Islandwide composting program that could help businesses comply with the state’s ban on commercial food waste, which went into effect two years ago. The six restaurants taking part in the project — Isola, The Port Hunter, Atria and The Square Rigger in Edgartown, and Park Corner Bistro and Lookout Tavern in Oak Bluffs — have composted 4,584 pounds as of Saturday, with more on the way this summer. It is part of a yearlong study that began in March with funding from the Martha’s Vineyard Vision Fellowship and will lead to a set of recommendations for how the Island can reduce its food waste. The Vineyard produces up to 20,000 pounds of crop waste every year, according to Island Grown Initiative, which runs a gleaning program to distribute unused produce to Island schools and people in need. Don Hatch, manager of the Martha’s Vineyard Refuse District, estimates that the Island ships between 10,000 and 12,000 tons of garbage off Island every year, not including wood and construction materials — and that food accounts for almost half the total weight. The four-month pilot project, called Composting on the Coast, will help develop an estimate for how much food waste the Island produces. 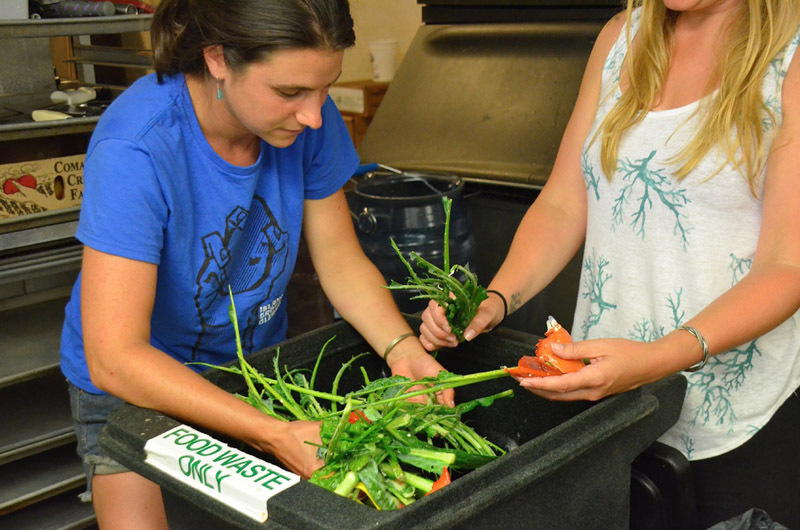 “In order to come up with the best recommendations, we just need to know what volume we’re dealing with,” said Sophie Abrams, who conducted a smaller composting study at Thimble Farm a few years ago is now leading the Islandwide study. To support the pilot project, she plans to launch a fundraising campaign on the website gofundme.com this weekend. A new Facebook page, Composting on the Coast, launched in June. The Martha’s Vineyard Shellfish Group, which has supplied the pickup truck and an intern, Zach Gordon, will eventually return the old shells to the water where they will create habitat for new shellfish. And Morning Glory Farm will spread the compost on its fields. Ms. Abrams and her intern, Wendi Goldfarb, will continue looking for longer-term solutions as the pilot progresses — including the possibility of municipal composters. But farms seem a more likely host for the Island’s food waste, at least in the near future. It was unclear whether the final recommendation would point to one large facility or a network of composting sites; and whether it would favor keeping the material on the Island or shipping it away. But Ms. Abrams seemed to favor the local approach, which she believed could be less costly and more efficient. Ms. Goldfarb, who works part-time for an Island landscaping company, noted that many nurseries on the Island buy large amounts of compost from Vermont and Maine – highlighting an opportunity to use local resources instead. Some worry about an influx of nutrients on the Island, where most of the coastal ponds already suffer from too much nitrogen. But Ms. Abrams didn’t see the nitrogen problem as closely tied to food waste, since the influx of compost from off-Island was likely balanced by the outflow of organic waste on the ferries. But she still believed that keeping more of that waste here may be the best approach. “You are really closing the loop on the food cycle when you are able to process food waste on the Island,” she said. Some restaurant owners resisted having to change their routines for the pilot project, but others were lining up to participate. “There were more restaurants that were really interested in participating, but we had to start small,” Ms. Abrams said. Expanding the program would likely depend on more farms getting licensed to accept compost. Morning Glory Farm already handles a large amount of food and yard waste from around the Island. Under the state ban, any business producing more than one ton of food waste per week would need to compost or repurpose it. The ban could also extend to residential waste in the future. To help get people thinking more seriously about the issues, Ms. Abrams is working with organizers of the Martha’s Vineyard Agricultural Society Fair to compost all the organic waste during the four-day event in August. The logistics will likely highlight the challenges of getting people to change their routines. Some restaurants have welcomed a decline in their trash volume, but based on her experience working for a bakery that composts all of its food waste, Ms. Isomichi wondered if some of the food at the six restaurants was still ending up in the trash. “I’m sure there would be more if I really chased down every person,” she said. 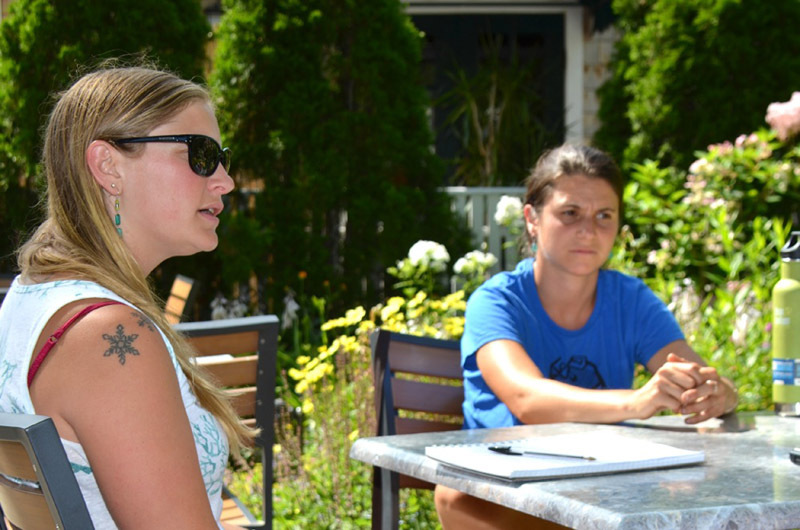 Looking ahead, Ms. Goldfarb hoped the pilot project would gain enough momentum to cause a permanent shift in the way the Island deals with food waste. and ....think of the recycling opportunity for shells to "walkways", parking spaces -- love the recycling leadership on MV! I love this approach. High fives to the patient and brave Ms. Abrams and her crew. Taking the long view and making slow, important change is critical for our future! This is great. I used to work for a composting / potting soil production operation in Vermont. Food residuals are a great resource for compost, and waste stream reduction is key to every community. I find it funny that composting is a new thing. Well over 50 years ago, we did it all the time plus we burnt our trash because we used brown paper bags. Coffee cans were used for school projects and Dad's garage. So re-purposing is not a new thing. We had to do it because money was tight. The instant and I cannot wait society produced all the trash now they have regrets. So we are all paying for it with regulations and fees.